I’ve often heard, in many turns of phrase, “you can’t choose your family but you can choose your friends.” I’ve also found, through my experiences, you find friends who become family and those are cherished relationships throughout life. However, what draws us to these people, these friends of ours? Is it who they are or who we think they are? Unique are the relationships between couples. There’s a different kind of dynamic when it comes to a foursome, especially two married couples. We forget that we often only see glimpses of the lives of our friends. What happens behind closed doors? Is it really our business? 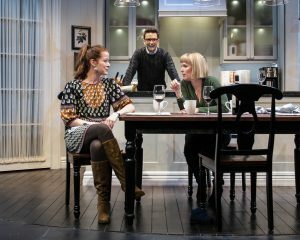 Everyman Theatre‘s latest production touches on these issues and questions in Dinner with Friends by Donald Margulies, Directed by Vincent M. Lancisi and leaves us wondering what we would do if the friends we know are all of a sudden… different. Briefly, Dinner with Friends concerns itself with two married couples, Tom and Beth, and Gabe and Karen, who have known each other for many years. The foursome is the best of friends and everything seems to be status quo until Beth abruptly, over dinner with Gabe and Karen, spills the news that she and Tom are divorcing and that Tom is in love with another woman. Later, Tom discovers Beth has already told their best friends and is angry that she has the advantage and sympathy for telling them first, by herself. The feelings of Gabe and Karen do shift negatively for Tom and he tries to tell his side of the story. Flashback 12 years earlier when Tom and Beth first met, to show how it was between the two in the very beginning. Flash forward to present day and both Tom and Beth are moving on and evolving while Gabe and Beth, feeling they have to choose sides, at first, begin to see the meaning behind the friendship with Tom and Beth. The first thing you may notice walking into the theatre is the superb Set Design by Donald Eastman. Eastman has given us an authentic and clean design that pulls the audience into the story as if we are sitting at the dinner table with these couples. The use of a revolve that sections out each scene is resourceful, allowing for smooth, seamless transitions from scene to scene and keeping the momentum of the story intact. Eastman’s attention to detail and realism is spot on and he deserves accolades for his efforts on this production. Speaking of momentum, Vincent M. Lancisi’s direction is on point and his staging is simple, but effective working in tandem with Eastman’s Set Design. Lancisi has a tight grasp on this story and its characters and he presents it well with an apt ensemble and a solid vision. It’s a human experience piece and he keeps the settings and characters relatable without the bells and whistles which makes this production successful. 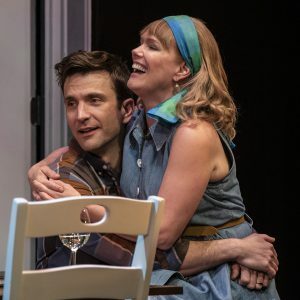 Moving into the performance aspect, M. Scott McLean and Beth Hylton take on the roles of Gabe and Karen, a couple who seems to have their act together. McLean was a little scripted and stiff at first, but eventually found his grounding and portrayed Gabe as a charming, likeable character and he emoted the devotion his character has to his wife, making for a strong, confident performance. Hylton, always a pro, seems to embody the character of Beth and makes it her own. Her delivery and mannerism fit the character perfectly and she’s comfortable in the role giving an assured and solid performance. The chemistry between these two actors is praiseworthy and their understanding of the complexities of the characters (looking good on the surface with uncertainty deeper inside), is commendable. McLean and Hylton play these character with a certain authenticity that makes for enjoyable and thoughtful performances all around. 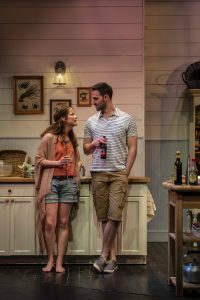 Megan Anderson and Danny Gavigan take on the roles of the other, more difficult couple, Beth and Tom and they hit the nail on the head with both of these characters. Anderson, who rarely disappoints, has a good grasp on her character and plays her to the hilt. She understands the turmoil and confusion in her character and her portrayal is on point with a good blend of the expressions of hurt and anger, feelings to which we can all relate in one way or another. Her delivery is near flawless and her mannerisms and movement for Beth, a free spirit, makes for a delightful and moving performance. Gavigan, too, understands his character and plays him so well, you might end up rooting against him. Again, it’s a human experience piece and the author seemed to have it right when he assumed we (usually) take the side of the person who breaks the news first. I did. I took Beth’s side and sneered at Tom for the rest of the production. However, Gavigan doesn’t make it hard to sneer at him with his impeccable performance of a man who is trying to find happiness no matter who it hurts. It’s a double edged sword for this character. We want people to be happy, but we also want people to be responsible. Sometimes the two don’t match up and the consequences are vast. Gavigan has a solid grasp on the character and his issues and plays him superbly. Superbly enough that you want to hate him. That’s good acting! Together, Anderson and Gavigan have a natural chemistry that transcends the script and is authentic making for performances that give us all the feels and emotions that come along with this kind of issue. Kudos to both for durable, intense performances. 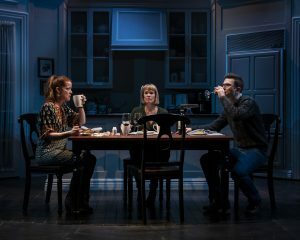 Final thought… Dinner with Friends at Everyman Theatre is a poignant, thoughtful look at friendship and marriage with a well-written script and a tight, solid ensemble. It’s a human experience piece, without a lot of fluff and it has us walking away thinking and questioning, which any good theatre will do. The actors take the roles and make them their own and help us relate to these four complex souls. The production value is top-notch with an ingenious Set Design that is intricate but doesn’t overwhelm and staging that keeps the action flowing seamlessly. Get your tickets now. You won’t want to miss this one! 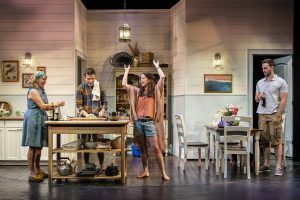 This is what I thought of Everyman Theatre’s Dinner with Friends… What did you think? Please feel free to leave a comment! 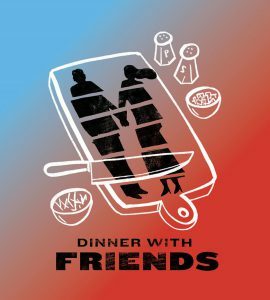 Dinner with Friends will play through April 7 at Everyman Theatre, 315 W Fayette Street, Baltimore, MD. For tickets, call the box office at 410-752-2208 or you can purchase them online.